A Private, Peaceful, Spacious Hideaway! Wanting to reconnect with a family or class reunion? Planning a church retreat or corporate event? 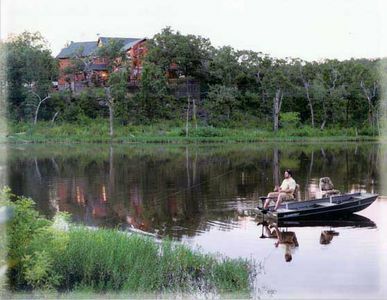 The Lodge is a very versatile retreat that is sure to meet your needs! Roberts Retreat Lodge is a 'one-stop-get-away' for family gatherings, church retreats, corporate events, weddings, outdoor excursions, and any other large gathering ... it is perfect for most any occasion. Very family-friendly! There is plenty of room to nature walk, mountain bike, ride ATVs, enjoy an outdoor scavenger hunt, roast s'mores around the firepit, and for the kids to run and enjoy the outdoors. Inside, the views are just as incredible … the 2-story windows overlooking the private lake brings the outdoors in! Cozy up in the large gathering area furnished with sofas, papasan chairs and recliners. The extra large stone fireplace is sure to warm your heart as well as your toes! A 70” flatscreen TV downstairs and 60” flatscreen TV upstairs make movie nights a must! This rental is incredibly roomy and can accommodate a large group, sleeping 32 people comfortably in its 6 bedroom, 8 bathroom layout. Space is no issue in this Lodge! It’s perfect for families with kids. Just send the kids upstairs where they can challenge an opponent to table tennis, watch a movie, read books in the library corner, and so much more. Downstairs, complete a puzzle or play board games in the sun room, or curl up to read a book or relax in the chairs by the large picture windows overlooking the lake. For corporate retreats or management training events, large groups can easily separate into smaller groups in different areas of the Lodge, upstairs and down, for small group meetings. Rent it for a mid-week day or stay several nights. •	For additional sleeping over 32 guests, consider the floor space to spread out air mattresses! There are 5 sofas as well! Wake up each morning to enjoy coffee on the deck, or on the dock benches as you watch the sun come up. Gather around the large kitchen table for meals + additional tables in the sun room accommodates up to 26 people to dine at tables. The over-sized kitchen allows the chef plenty of counter space, a second sink in the island, full-sized side-by-side refrigerator & freezer, dual ovens, 6-burner gas stove-top, BBQ grill on deck, microwave and dishwasher. This kitchen is fully equipped for all your needs including mixing bowls, measuring cups & spoons, cheese grater, cookware including frying pans, pots (various sizes), baking ware, toaster, blender, electric mixer, tea kettle, large group-size coffee pot, serving platters& utensils, punch bowl, juice jugs, dinner plates, bowls, flat ware, drinking cups, coffee mugs, and a large walk-in pantry for storage. We've tried to think of everything, but please ask about additional items that may be available but not listed. The large laundry room has separate access from the outdoors for muddy feet. This large, open room is also perfect for storage and keeping your supplies organized. This room also boasts an additional fridge/freezer with ice maker for your convenience.